The popular numerical brainteaser is a fun way to work your brain, and Sudoku fans of all levels will love this collection. 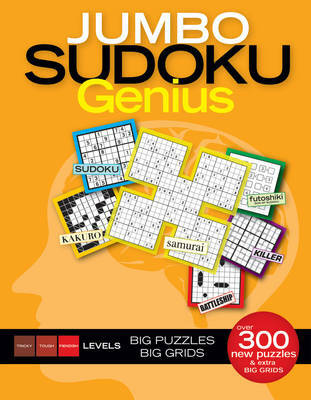 "Jumbo Sudoku Genius" includes classic Sudoku as well as Samurai, Kakuro, Killer, and "Son of Sudoku", Futoshiki puzzles. All the puzzles are rated on a scale of hard to fiendish. If you are looking to finally be challenged by Sudoku, this is the book you have been waiting for. Sudoku puzzles continue to run in top newspapers and magazines across the country. Because every puzzle is completely different, Sudoku appeals to puzzle fans of all ages.